It was one for the ages Friday night, a triple-overtime classic seemingly only football programs as storied as C.M. Russell and Helena Capital were capable of. The Rustlers outlasted the Bruins 28-27 in a thrilling battle that felt more like a November playoff game than an early September contest at Memorial Stadium. The Rustlers headed into Friday night’s matchup against the Bruins with a clear game plan: stop the state’s most explosive offensive weapon Gunnar Brekke and rush the ball. Goal accomplished. And in a few extra periods, no less. The Rustlers held the running back to 99 yards, and amassed 223 yards of their own on the ground. Defense dominated for most regulation, as neither team found much breathing room on the offensive side of the ball. It’s only fitting that defense themed overtime, too. In the first added period, the two squads forced each other into field goal attempts, which they both botched. Overtime part two saw both teams notching touchdowns. Bruins’ quarterback Brian Sinrud used a 1-yard keeper to put his team on top before Josh Horner answered with a 3-yard QB run of his own, setting up for a telling finale. In the third OT, Horner tossed a perfect 10-yard spiral to Justin Pfennigs and Tanner Olsen added the crucial extra point. Sinrud countered with yet another scoring scamper. This time, however, Capital opted to go for a 2-point conversion instead of kicking the game-tying field goal. The scheme backfired as the Rustlers swarmed Brekke before he could score. Pure jubilation followed with CMR’s sideline erupting and players piling on each other at midfield. “I’m extremely proud of this team,” Johnson said. The two teams battled to a 14-14 tied late in the fourth quarter. 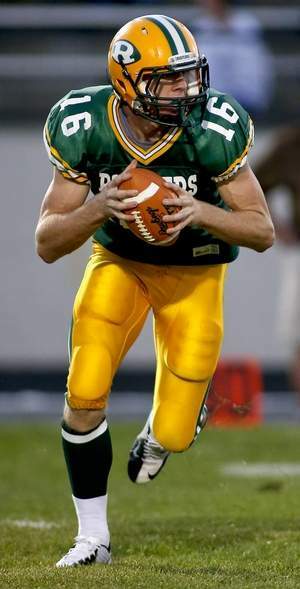 In his first game starting as quarterback, Horner engineered a solid game for the Rustlers, accumulating 108 yards on the ground and 111 through the air. With the score tied at 7-7, the Rustlers fumbled the ball deep in their own territory early in the fourth quarter and the Bruins capitalized. Brekke used the short field to evade three Rustlers and cross the end zone, giving Capital a 14-7 advantage. Johnson’s squad wasn’t about to roll over. Horner orchestrated a drive down to the goal line and on fourth and goal from the 5-yard line, with the crowd on its feet, Horner kept it himself. The field general burst into the end zone, tying the game and setting up for a nail-biting final five minutes of regulation and three OT frames.